What Are Thoughtful Gifts for Mom? Get your mom a gift that shows her you really care this year! 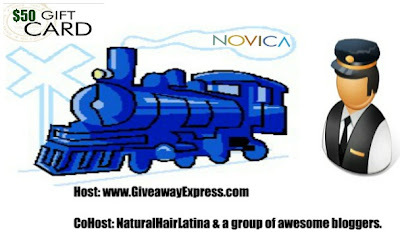 Our friends at Novica would like to give a lucky reader a $50 Gift Code just for being a fan of the site! Complete the easy giveaway tools entry app and enter to win! What a great Mother's Day gift a $50 Dollar Gift Card can get you a variety of items this would be great not just for Mother's But Daddy's too. Earn Ambassador Points and Win Prizes Enter for a chance to win your perfect morning (Mommyyof2babies) received no compensation for post and not responsible for prize fulfillment. Promotion is no way sponsored, endorsed, administered by, or associated with, Facebook, Twitter, Pinterest, Stumble, Digg or Google.